When people ask what Transformational Presence work is all about, I usually say two things. First, Transformational Presence is about personal presence – helping people become aware of how they “show up” to each day, and giving them tools, skills, and understanding for how to create a physical and emotional space in which transformation can occur. Secondly, Transformational Presence is about seeing and thinking differently than others do. It has been said that until you can forget what something is called, you can’t really see it. In other words, until we can let go of what we think we know about something already, it is hard to discover anything new about it. Transformational Presence involves letting life show itself to you on its own terms. And that takes some practice. My dear friend and colleague David Robinson has just published a brilliant book on learning to “see.” This week and next week, I’ll be introducing David’s book to you and sharing some of his thoughts. Next week will also include an excerpt from an early chapter. The following is David’s story about how this book came to be. In 2013, I went on a pilgrimage of sorts. 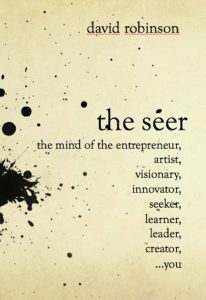 During my wandering I wrote a book, The Seer: The Mind of the Entrepreneur, Artist, Visionary, Innovator, Seeker, Learner, Leader, Creator…You. It is a long subtitle! I learned on my pilgrimage that everyone is on a path of transformation. Transformation is, in this aspect, ordinary. I learned that my work must be ordinary to be extraordinary. A paradox! He was right. Artistry is about how you see. Innovation is about how you see. Leadership is about how you see. Transformation begins with how you see. Everything else is execution. His lesson that day was simple. It was powerful. It was transformational. And, like all things simple and transformational, I didn’t recognize it at the time. I discounted it because it was so basic. He planted a seed that day that took me many years to understand. And then it took me a few more years to embody it. It was with great delight that many years later I recognized his lesson as a threshold to my soul mission. I am on this planet to help people see. The core of his lesson was this: most people merely look; they do not see. Their thinking gets in the way. In other words, we see what we think – which means we do not “see” at all. We miss the majesty of what is right in front of us. More importantly, it means we do not see the majesty of what is within us. I am on this planet to help people see the majesty within themselves. The Seer is a guide to seeing the majesty within so that we might fulfill our extraordinary capacity. I’ve been fortunate to work in many worlds: corporate, artistic, non-profit, educational, large groups, small groups, entrepreneurs, individuals, with leaders in the center and innovators on the margins. I’ve come to believe that corporate change and personal change are largely the same thing. A business finds its heart in much the same way a person finds their heart: they recognize that they are in service to something bigger than their bottom line. They focus on what they bring to the world instead of what they might get from it. A profound change of focus is the blossom of learning to see. The power to place your focus where you desire to place it is the mastery of a seer. I’ve learned in my walk that my musty old professor was only half right: learning to see is of great value. He was musty because he’d learned to see, but he didn’t understand how to make all the world his studio. He had yet to grasp the understanding that transformation comes to life in the execution. The real value comes when you live it. And living it helps you see with greater and greater clarity. It’s a feedback loop. Presence is a practice. A seer does not gaze into the future; a seer stands with clarity in the present moment. The Seer offers both a strategy and a compass for people from all walks of life who desire to 1) learn to see, so that they might, 2) develop more fully their practice of presence, so they might 3) fulfill their potential. Pattern recognition is most often the epicenter of change management for organizations. The same might be said of people. We are generally blind to our patterns, so, instead of seeing our patterns of action, patterns of choice, or patterns of thinking, we believe that we have a problem. The eyes that can see a pattern are much different than the eyes that see problems. The eyes that see patterns are eyes that see choices. The eyes that see choices also see opportunities. The eyes that see problems can only seek fixes to the problem. The eyes that see patterns will ultimately seek to create new patterns. Problem-seers fix. Pattern-seers create. What do you see? Once an organization or individual is conscious of their patterns, they inevitably see the story that their patterns illuminate. We operate out of patterns. Our patterns are the bones or superstructure of the story we tell through the actions of our lives. Seeing pattern illuminates story. Changing story means changing patterns of thought, patterns of choice, and patterns of action. What is the story you wrap around your patterns? When the story veil drops, our capacity for choice reveals itself. The story of “things happen to me” drops away. When choice becomes distinct from circumstance, we see beyond what we think. We see how we actively create our lives through our patterns, our story, and our choices. Transformation comes to life in the execution: living the choices and creating the patterns of focus placement. Mastery of choice is at the heart of presence. And, choice loops back to pattern. Do you see the majesty within? The Seer can point you in the right direction. P.S. If you are feeling inspired by David’s words above and are eager to learn to see in more expansive and creative ways, download David’s new book, The Seer.